So...have you hooked into the salted caramel trend?? I have. Up to my ears and loving it. I had my first taste of Salted Caramel in ice cream when we went to the Western and Southern Open Tennis Tournament down in Cinci this summer. I cannot remember the brand, but it was divine. 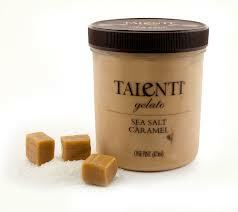 Just the other week, my sister brought over 5 pints of Telneti gelato. Two of them were salted caramel. I fell in love all over again. She brought the extra pint of salted caramel for me to eat all by myself. Which I unfortunately did, although I did stretch it out over 4 nights. So yummy. 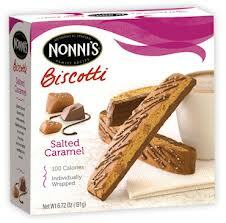 I then found that Nonni's brand Biscotti had a new "Salted Caramel" flavor. I picked up a box and kind of forget about them for a week or so. I remembered them two nights ago and oh my goodness. Fabulous and only 100 calories. So it is a great little treat to help satisfy my evening sweet tooth. Would love to hear your thoughts on salted caramel. Have you tired it? Love it or hate it? Love your new photo! Do you have your hair pulled back or shorter? Very nice! OH dear! We love all things Salted Caramel around here. Starbucks has the best version during the winter holidays! So sad I can't get that now. Oh my! Don't need another addiction but these sure sound yummy! 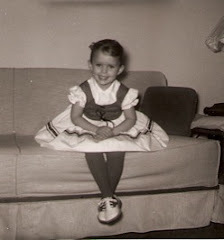 Fun catchin' up on your blog ... I have been a horrid bloggin' buddy. Are you on FB? I post daily and would be fun to connect.